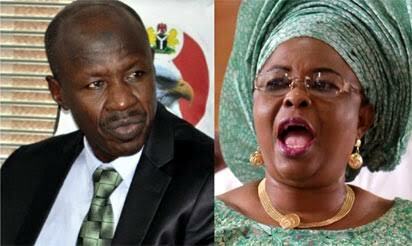 Ex-First Lady to EFCC: "Let’s Settle"
According to The Nation's report, the ex-First Lady allegedly spent the cash at TFS stores, Selfridges, John Lewis, Kingsgate, Sainsbury’s, Harrods, Marks and Spencer, Dolce and Gabbana, and Gina. On the same day at Hulian Xinguang Beijing CN, she blew $13,069.68 on some luxury items. “Since we have uncovered all these suspicious deposits, we only need her to account in court on how she came about them. Our crack teams worked day and night to trace these funds.